This sleek, light aesthetic often carries over to what mermaids might wear on land. As a matter of fact, most mermaids mentally class humans with other mammals such as dolphins, so it’s only natural to them to consider themselves superior in every way. Because of this perspective, mermaids tend to consider their own style to be obviously better than the fuller, often gaudier fashions popular among human women. Still, sometimes even for a mermaid it’s fun to pile on the fabric. 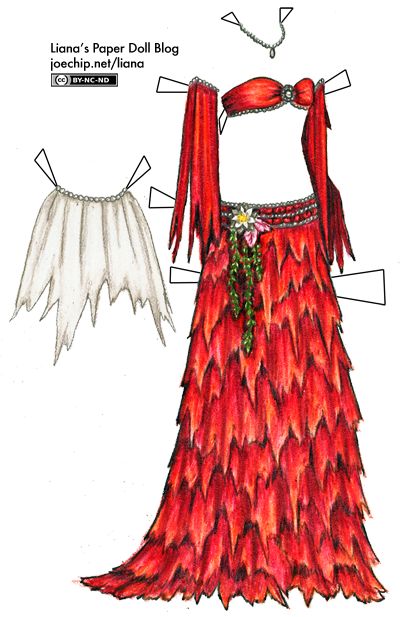 This bride wanted most elements of mermaid wedding gown design for her own dress: the traditional red, the romantic tatters, the bare midriff that would shock most human brides. Indeed the top is such a common design for mermaid wedding outfits that it’s rather cliché. But now that she doesn’t have to worry about sharks, she wanted a skirt with something like ten layers of fabric. The resulting creation looks odd to both human and mermaid eyes alike: the mermaids criticize the mismatch of tatters and heavy skirt, while the humans scorn just about every other part of it. But the bride and her partner adore it, and they’ve never quite been known for paying undue attention to the opinions of others. The tatters are a long-standing symbol of enduring, patient love among mermaids (and someday, remind me, I’ll tell you the story that most mermaids know a version of that started the trend). Of course, to humans, it just looks ragged and ridiculous. The tailor of this particular outfit took one last look at her beautifully balanced layers of fabric, then actually curled up in a corner of a different room and cried while her apprentice “distressed” the edges. If this dress were not so light and summerish it would be cristmassy because of the green and red I like it though (human or not) and find the part about the tailor kinda funny. You have outdone yourself with red! I love it!The skirt edges remind me of Siamese fighting fish tails-I don’t know if that is a good omen or a bad one for the bride. I want my wedding dress to have a tattered skirt in mermaid fashion ^_^ Because it looks awesome! The skirt caught me off-guard at first (but then again, I’m human :P) but after looking at it a little more I love this. Mermaid Mondays were the best idea you’ve ever had. This is a really cool dress, but I was wondering when you will do a mermaid outfit with a tail again. I like the land dresses, but i’m beginning to miss the other mermaids! It’s stunning in a bellydance way, but I would like to see mermaids with tails again. I adore your mermaid culture stories. You are so imaginative! Have u read Eragon? it’s a good book with good costume ideas. Wonderful story and wonderful gown. Has something happened to the poll again? That’s an awful lot of tuxedo love. Why are the mermaid wedding dresses red? It wasn’t necessairly what I was imagining. But I absloutely LOVE this mermaid monday dress. It’s beautiful, yet, crazy? Thanks, everyone ^^ Don’t worry – a real mermaid tail is on the agenda for next week! Tana, they’re red because red seaweed is probably the most traditional wedding decoration, so the color came to be associated with weddings. Taylor, I don’t know enough about sari yet, so you probably won’t see any this week, but that’s a great idea because they sure are beautiful. As for wedding kimono, I can’t just limit them to a day ^^ You’ll see some of them by and by.